In the late nineteenth and early twentieth centuries, the self-proclaimed leaders of various immigrant communities in Buenos Aires created ethnic spaces in an effort to maintain the cultural and linguistic pluralism in Argentine society that their own migration had created: community leaders of many European backgrounds built charities, mutual aid societies, schools, and places of worship, and they encouraged people of a common ethnic background to use those institutions. Nevertheless, immigrants’ efforts to assert their belonging in Argentina and to create lasting communities were never entirely successful. In the case of German speakers, in particular, the leaders of community institutions faced off against children, Spanish-speaking spouses, socialists, German-speaking Catholics, and many others who all struck their own balance between community, ethnic heritage, and Argentine belonging. This book analyzes the activities and fantasies of the people who sought to create a German community in Buenos Aires and the behavior of others who challenged that project. It argues that ideas about the future drove German-speaking immigrants to carve out a place for ethnicity and pluralism within the cultural and linguistic landscape of Buenos Aires. At a moment when there was increasing pressure from the Argentine state and new nationalist forces to create a culturally homogeneous citizenry, the leaders of German-language institutions in Buenos Aires promoted a pluralistic vision of national belonging, insisting that it was possible to be both ethnic and Argentine. Between 1880 and 1930, German speakers, other immigrants, and Argentines of various backgrounds were negotiating the terms of citizenship and the nature of cultural pluralism. The efforts of immigrants to create communities led to conflicts between Argentine nationalists and immigrant educators; between children and parents; between parishioners and religious leaders; and between the leaders of community institutions and thousands of other immigrants who remained indifferent to those visions of community. Underlining the significance of temporality and the future to the social history of migration offers new perspectives on how state institutions developed, how a culturally plural society formed, and how immigrants and families participated in that society. As David Engerman notes, how historical subjects envisioned their future reveals much about those subjects and the period in which they lived.1 Reinhart Koselleck stresses the value of studying not only the experience of historical subjects but also their “horizons of expectation.” According to Koselleck, experience—a key focus of social and cultural historians—can only truly be understood by also analyzing expectation.2 The two are interdependent; “no expectation without experience, no experience without expectation.”3 Revolutionaries do not spring into action, workers do not spend long days in factories, and young people do not rise in protest without having given some thought to the future. Similarly, people did not cross the Atlantic Ocean, parents did not found German-language schools in Buenos Aires, and wealthy men did not donate large sums of money to charity without having some thoughts about the time to come. For the German and Spanish speakers who between 1880 and 1930 produced the sources that are at the core of this study, the future was not a long way off. Their objectives extended beyond the present to include moments anywhere from one year to several decades in their future. As Koselleck writes, “the future, which is anticipated in terms of an expectation, is scattered among an infinity of temporal extensions.”4 The horizon of expectation of German and Spanish speakers in Buenos Aires was often about a decade, the time it would take a child entering elementary school to finish his or her studies or the time it would take young people to become adults and form their own families. In other cases, the timeline was less clearly defined. Argentine school reformers wanted to have a literate and Spanish-speaking citizenry. Devout German-speaking Catholics wanted to have a state that shared its power with their church. Affluent German men wanted newly arrived workers to succeed in Argentina rather than return to Europe. In the study of migration, “origins” are a common point of methodological departure. Scholars glean the word from national censuses and from immigrants’ discussions of their homelands. Yet the future occupied as much space as the past in immigrants’ thoughts about family or community. German-speaking immigrants and people of many other backgrounds in Buenos Aires and throughout the Americas spoke about “preserving” or “maintaining” their language and culture, about the “next generation,” and about children “losing” language or culture. All of those terms reflected an interest in keeping Buenos Aires a culturally plural society long into the future. While some migrants in Argentina may have viewed the country as a brief sojourn in their lifelong trajectories, those who were involved in various ethnic organizations, who had children, or who worried about economic, social, and political issues thought about their belonging and their future in Argentina. The case of German-speaking immigrants and their bilingual children illustrates broader themes in the history of migration. As Jeffrey Lesser and Raanan Rein have shown, much can be learned about ethnicity in Latin America by stepping away from the assumptions of any single group’s particularity.5 In Buenos Aires, there were many parallels between ethnic groups in matters of social welfare and education. The German-language charities, work placement services, and hospital in the city resembled other Italian, Spanish, French, British, and Jewish institutions.6 Argentine children and almost all foreign-born parents were bilingual, regardless of the immigrant generation’s dominant language. The schools that every immigrant group created taught mainly Argentine citizens, and they did so in Spanish and one other European language. Throughout this period, there was a group—made up of prominent intellectuals and politicians such as Emilio Gouchón, Ponciano Vivanco, and Francisco Barroetaveña—that continued to support the idea of individual liberties and the right of parents to educate children in another language, arguing that this helped the republic.12 Yet the new nationalists “perceived both the old liberal elite and the new immigrant labor activists as cosmopolitan, internationalist foes: the first willing to sacrifice the nation’s cultural integrity and spiritual essence in the name of material progress; the second yearning to do so on the altar of godless and global anarchism and, later, communism.”13 With this hispanophilia, Argentine nationalists articulated a set of ideas about citizenship and belonging that lauded the benefits of the Spanish language and Spanish cultural heritage as well as Spanish immigration while deriding and excluding everything that was not Hispanic. One way that this nationalist thought had an impact on Argentine society in this period was through schools. In the 1880s and 1890s, reformers came to see the emergent system of public and universal education in the city of Buenos Aires as the vehicle that would help them change the cultural and political worldview of subsequent generations.14 The passage of time and expectations about the future were a crucial part of this project. Language was a central feature of this new school system, and reformers’ fears about the widespread use of foreign languages in their society drove their efforts.15 As a result, they attempted to use schools to shape the linguistic and cultural components of the national body, and the Spanish language became a core feature of their evolving definitions of citizenship. It was against the currents of Hispanismo that immigrants of many backgrounds in Buenos Aires were swimming in the early twentieth century. In creating bilingual schools that taught young Argentines German, French, English, or Italian alongside Spanish; in offering social welfare services along ethnic lines; and in giving Catholic sermons in a variety of European languages or creating Protestant and Jewish places of worship, immigrants contested these homogenizing ideas about Argentina as a Hispanic nation. The very presence of millions of foreign-born people in Argentina in the early twentieth century undermined Hispanismo. Moreover, the pluralistic vision that German speakers and others had of their own and their children’s belonging in Argentina meant that the nation was by no means clearly defined, culturally or linguistically homogeneous, nor static. People of German heritage in Argentina often spoke about citizenship (using the words ciudadanía and Staatsangehörigkeit). According to Kathleen Canning and Sonya Rose, citizenship, more than being a simple question of voting rights or a synonym for nationality, describes a broad set of relationships and social practices that define the interaction between peoples and states and among peoples in communities.16 As a discursive framework, citizenship gives people the language, rhetoric, and categories “for claims-making, sometimes in the name of national belonging or on behalf of specific rights, duties, or protections, or visions of political participation.”17 For foreign nationals, naturalized immigrants, and Argentines of German heritage, citizenship described civic participation and inclusion, cultural behavior, economic and property protection, political voice, and mobility rights. Foreign nationals in Argentina benefited from many of the same privileges and had the same duties as citizens. For example, state-funded and state-regulated education affected Argentine and foreign adults equally because after 1884 almost all child residents of Buenos Aires—regardless of their parents’ legal status or voting rights—attended elementary schools. Children and families blurred the boundaries between legal and de facto meanings of citizenship in other ways as well. In 1910, 46 percent of the 1,231,698 residents of the city of Buenos Aires were foreign nationals.21 But many of these foreign nationals had children who were among the 54 percent of the city’s population who were Argentine citizens, a demographic fact that gave many noncitizens a vested interest in civic rights, education, politics, and the future definition of the nation. The thoughts and actions of German speakers—alongside other immigrants—redefined what it meant to be an Argentine citizen. The role of affluent immigrants in the provision of social welfare services, the involvement of German-speaking Catholics in debates about secularization, the desire of German-speaking Lutherans to make Argentina a more religiously diverse society, and the efforts of parents to educate their children in bilingual schools are all activities connected to people’s interest in citizenship. Despite their country of birth and whatever their nationality, thousands of German speakers in Buenos Aires felt that they belonged in the city and imagined their future there. They participated in the development of social practices in relation to both state authority and the other residents of the capital city, and they wanted to create ethnic communities that would become lasting components of Argentine society. In the study of migration to Argentina and elsewhere in the Americas, the ethnicity of the chosen subjects is often taken as stable; a common research approach is to locate a group (such as Jews, Italians, or Portuguese) and then analyze the group’s activities.22 In studies of German speakers in Argentina in particular, there is a series of implicit assumptions or explicit statements about their inherent unity, and there is a tendency to reproduce the categories applied by community leaders, cultural nationalists in Germany, and Argentine census data.23 However, the category that supposedly defines an ethnic subject or ethnic group also merits attention. Many Germans in Buenos Aires were born in the city and spoke Spanish as a native language, while many others retained their German nationality but devoted a lot of energy to worrying about the economic future of their Argentine children or the place of their church in Argentine society. Ethnic categories are situational, overlapping, and contradictory, and ethnicity is constructed in a dialogue with the surrounding ethno-social context.24 People speaking about their own or other people’s ethnicity could try to define it by focusing on important markers of cultural difference such as language or religion. It is worth stressing that language, in this context, may be defined by any combination of linguistic ability, linguistic behavior, and linguistic identity, which can be contradictory forms of measurement. Ethnicity, likewise, may be defined by group identification, categories of citizenship, and/or feelings of belonging. Thus, the supposed members of what is commonly seen as a single ethnic group (Germans in Buenos Aires) held radically different opinions about what it meant to be German. The term “German” (Deutsch or alemán), as it was used in Argentina between 1880 and 1930, often included people born in Germany, Austria-Hungary, Russia, Switzerland, Argentina, Brazil, Paraguay, and Uruguay. Enthusiastic leaders, eager to increase the size of their communities, embraced the label, as did Spanish speakers and immigrants of other backgrounds who did not see the need to distinguish among Germans, Austrians, German-Brazilians, Saxons, or Bavarians. Multiple nationalities, regional identities, denominational differences, and generational divides led many in Buenos Aires to propound contradictory definitions of German ethnicity. Bilingualism permeated the lives of people of many backgrounds in Buenos Aires; this was not unique to German speakers. Bilingualism can involve an imperfect balance between two languages and can evolve throughout a speaker’s formative years. A three-year-old might speak German as a dominant language, but by the time she is eleven and attends public school, she may have developed a more complex relationship with language. She may be a German speaker, but a native speaker of Spanish might also assess the same child as a Spanish speaker. This eleven-year-old may have mastered the pronunciation of German phonemes and have an advanced proficiency in the language when talking about food or family. However, she may be more comfortable talking about cinema, novels, politics, or finances in Spanish. Every German speaker in Buenos Aires was to some extent also a Spanish speaker. The varying levels of language proficiency that immigrants had and that others worried about are an important but little-researched topic in the history of migration. In the case of German speakers in the Argentine capital, many people were concerned that others, particularly children, did not or could not use the German language the way they should. These concerns were shaped by adults’ observation that most “German” children in Buenos Aires readily spoke Spanish and that they were Argentine citizens. Some children used German at the German-Spanish bilingual schools they attended, but they would also speak Spanish at home with one of their parents, a housekeeper, or their siblings. Others spoke German at home and at church while they attended an entirely Spanish-language Catholic or public school. Many adults worked and socialized in Spanish while they concurrently read or worshiped in German. The term “community” has occupied a large place in the historiography of migration to the Americas. Nonetheless, this category, just like ethno-national categories (such as German, Italian, or French) and those describing religious groups (such as Lutheran, Catholic, or Jewish), needs to be analyzed. As Rogers Brubaker and Frederick Cooper argue, categories based on ethnic identities erroneously impose an idea of “internal sameness” and “bounded groupness.”25 Brubaker and Cooper warn that “group boundaries are considerably more porous and ambiguous than is widely assumed. . . . This categorical code, important though it is as a constituent element of social relations, should not be taken for a faithful description of them.”26 Immigrants and Argentines of many backgrounds often used ethnic labels at the turn of the twentieth century, yet their terms created many overlapping categories that laid different claims to the meaning of ethnicity, the terms of Argentine citizenship, and the feeling of belonging. In a study of French immigrants in Argentina, Hernán Otero contends that an ethnic community “is an element to test and not an a priori fact, justified by the mere presence of people of a common national origin.” He stresses that historians typically study an ethnic core (núcleo étnico) while not always reflecting on “the proportion of people who make up that core.”27 Offering another solution to the study of ethnic communities, Lesser and Rein assert that “the study of ethnicity must include people other than those affiliated with community institutions” and that “unaffiliated ethnics” who are not part of formal institutions and who have exogamous marriage patterns should not be overlooked.28 They suggest that scholars turn to other kinds of sources to find other perspectives on ethnicity. Reading against the grain of the material produced by the self-proclaimed leaders of German communities in Buenos Aires can provide another answer to this problem. The records of many formal ethnic institutions dedicated much attention to those who were undermining their community project. Leaders worried about children who had only one German-speaking parent and children who preferred to speak Spanish. These sources also discussed large groups of people who were excluded from the image of the community that leaders fostered. Both Lutheran pastors and Catholic priests claimed to lead a community, which meant that they imagined at least two German communities in Buenos Aires. Nevertheless, their denominational definitions of German communities implicitly suggested that there were also nonpracticing, atheist, and Jewish German communities in the city. Like other ethnic communities, a German community in Buenos Aires was aspirational. People linked it to future expectations about the nature of Argentine cultural pluralism and their belonging in the nation. The discussion of a German community in historical sources does not prove that there was a unified community but rather shows that many people wanted to organize parts of their lives along ethnic and community lines. The boundaries of any community are fluid, and one could participate in a German or other immigrant community while also becoming involved in other communities reflecting social class, gender identity, sexuality, profession, hobbies, or neighborhood. From a more critical perspective, gender and class hierarchies shaped the institutions of ethnic communities; leaders used communities to gain social and cultural prestige in Buenos Aires society. The typically male-led community institutions fostered structures that created paternalistic relationships between wealthy and working-class immigrants and patriarchal hierarchies between men and women. At its core, community describes the collective ensemble of people and institutions that self-declared leaders put themselves in charge of and that a variety of people supported with their labor, time, and money. Leaders of immigrant groups in Buenos Aires and across the Americas were “self-declared” or “self-proclaimed” because they rarely stood for election or presented their ideas about community, ethnicity, and national belonging in contrast to other possibilities. With few exceptions, leaders were also among the more affluent German speakers in the Argentine capital. Working-class German speakers who paid monthly membership fees to the German Hospital Association and German-Spanish school associations rarely occupied leadership positions in these organizations, nor did the workers and the children who received services from these institutions. A common theme in the historiography of German speakers in Argentina is the political divide that emerged between monarchist and republican factions after 1918 and then the political divide between pro- and anti-Nazi groups that ruptured the community after 1933.29 Yet this vision of a German community that was supposedly united before the First World War gives exaggerated weight to European events and presumes that transnational influences trumped other forms of identification and affiliation, which in fact had created competing German communities before 1914. Children, spouses of other backgrounds, German-speaking Catholics, workers, and many other groups redefined the meaning of community, and their reasons for staying away from certain kinds of community institutions often had little to do with political events in Germany. There were more people of German heritage in Buenos Aires who were indifferent about Weimar politics than there were who took a stand on either the validity of the new republic or the lament for a lost empire. While the term Auslandsdeutschtum, “Germandom abroad,” became increasingly common in Germany, German speakers in Buenos Aires more frequently used the term Deutschtum, (“Germandom” or “Germanness”), between 1880 and 1930, a word choice that did not specifically place them abroad or emphasize their peripheral location. In those decades, people who used the term Deutschtum, whether they lived in Europe or the Americas, believed that it was something defined by language, religion, culture, biological heritage, and unique mannerisms. From a European perspective, Deutschtum represented an ethno-linguistic definition of the German nation. In the view of German speakers in Buenos Aires, however, being German could coexist with being Argentine, and Deutschtum typically connoted German ethnicity or being of German heritage. Parents, teachers, and religious leaders in Buenos Aires spoke of Deutschtum to express their interest in or concerns about transmitting language or denominational identity to Argentine children. A dominant theme in the history of German speakers in Argentina and elsewhere in Latin America is their relationship to Germany and the impact of major events in that country on people living “abroad.”42 It is often assumed that citizens of Imperial or Weimar Germany living in Latin America took an active interest in German politics or in the country’s imperial aspirations. As a result, the questions that scholars ask have tended to focus on how German speakers in Argentina or elsewhere in Latin America engaged with these European issues. At many times, however, people of German birth or heritage in Buenos Aires thought about their ethnicity without necessarily connecting it to imperial nationalism or major political developments in Europe. When parents took an interest in their children’s economic future in Argentina or their ability to speak Spanish and German at similar levels, when a German-speaking Lutheran became concerned about the growth of a small Protestant denomination in an overwhelmingly Catholic country, or when a German-speaking Catholic worried about the secularizing tendencies of liberal reformers in Buenos Aires, they imagined German ethnicity in an Argentine context. This is not to say that German imperialism or debates about the legitimacy of the Weimar Republic and later about National Socialism did not matter to many in Buenos Aires. Yet as a point of departure, those research questions overlook a vast body of documentary evidence that demonstrates how German ethnicity was constructed locally. As Raanan Rein points out in the case of Zionism and Jews in Latin America, “transnational ethnicity is not a more dominant identity component than national identity [connected to the new country].”43 Rein’s argument has great applicability in the case of German speakers in Argentina. German-speaking immigrants in Buenos Aires and their children (whether they had one or two such parents) sometimes participated in the Argentine labor movement, joined feminist organizations, ran for public office, played sports, or grew vegetables, and the time and energy they devoted to these activities surpassed their interest in central Europe to an astonishing degree. People’s interest in German ethnicity in Argentina should not, therefore, be read simply as a willingness to connect themselves to the global aspirations of Imperial and Weimar Germany. Although the First World War played a role in how some German speakers in Buenos Aires thought about community, citizenship, and ethnicity, there was far more continuity than disjuncture in the city between 1910 and 1930. As Stefan Rinke and Michael Goebel have both shown, what the war did fundamentally change was how Germans in Germany thought about German speakers living outside the borders of the new Weimar Republic, including in Latin America.47 The outcome of the war radicalized ideas about the nation and infused German nationalism with a much stronger racial component, compared to the decade before 1914. Those points alone, however, should not lead one to assume that changes in Europe became a dominant force in defining German ethnicity from the perspective of the people in Argentina themselves. Bilingual Argentines of German heritage who were born in the Americas did not immediately or fully recast their ethnicity in racial terms simply because many German speakers in Europe suddenly found themselves outside the new political borders of Weimar Germany. Instead, their interactions with other Europeans, indigenous peoples, people of African descent, and people of mixed race—both before and after the war—gave German speakers in Argentina and elsewhere in Latin America many other reasons to hold racialized, linguistic, and cultural views of German ethnicity. Just as the new context of Weimar Germany influenced the meaning of the nation, it was also the surrounding context that shaped the meaning of German ethnicity in Buenos Aires.48 These racialized ideas were particularly salient when German speakers in Buenos Aires discussed children. Adults cast the ethnicity of young people as, paradoxically, both permanent and in danger. They saw Germanness as something biologically inherited and also as something that adults needed to preserve. German speakers lived in many parts of Argentina in the late nineteenth and early twentieth centuries, but they were most concentrated in the city of Buenos Aires. In 1895, 31 percent of Argentina’s German citizens lived in the capital city, and 18 percent lived in the surrounding province of Buenos Aires; another 26 percent lived in Santa Fe and 11 percent in Entre Ríos, so that all told, 86 percent of all German citizens in Argentina lived in those four jurisdictions.60 The provinces of Buenos Aires, Entre Ríos, and Santa Fe also attracted significant numbers of German speakers from other parts of Europe, such as Switzerland and the aforementioned Volga region of the Russian Empire. German speakers from Russia and from Brazil settled in the territory of Misiones in the 1920s; it was only after the 1920s that significant numbers of German speakers began to settle in Patagonia.61 From 1880 to 1930, the city of Buenos Aires served as a regional hub for the Río de la Plata region. German-language print culture in Argentina, Uruguay, and Paraguay was anchored in the Argentine capital, as were German-language religious institutions. Vibrant and distinct rural cultures emerged in this period, but they were influenced by people and institutions in Buenos Aires. 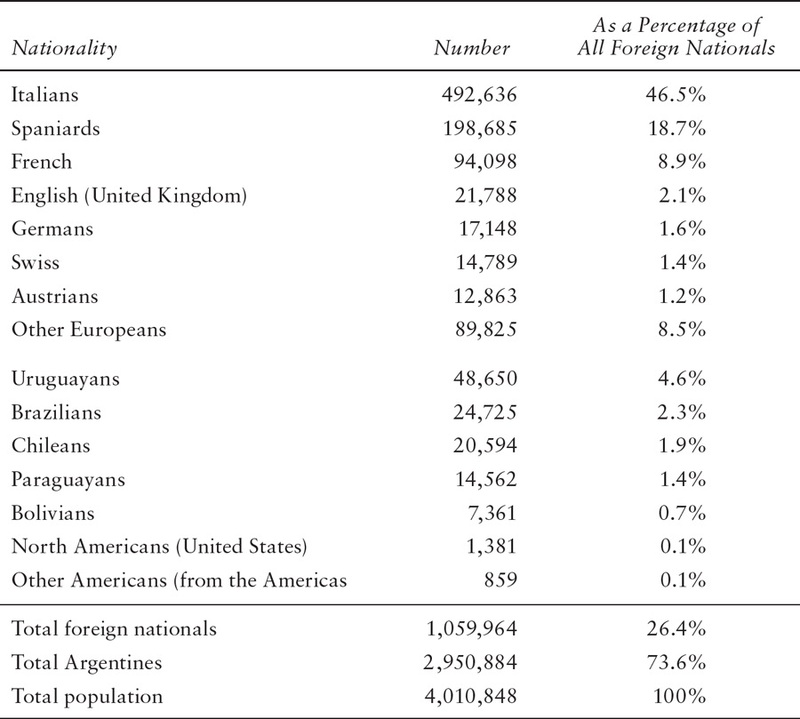 Tables 1 and 2 draw from Argentine censuses from 1895 and 1914 to illustrate the number of foreign nationals living in the country. The tables include statistics not only on Germans but also on Swiss and Austrians. A significant proportion of the Swiss were French speakers, and the data on Austrians also include many non-German speakers from the multiethnic Austro-Hungarian Empire. Neither the Argentine census data nor immigration statistics include information about the Argentine-born children of German heritage who were the focus of much of the community activity in Buenos Aires. The numbers provided by censuses include and exclude, in various ways, those who were born in the Americas or in Europe outside the boundaries of the German nation-state and people who thought about ethnicity in different ways. Generational differences, denominational identity, varying degrees of bilingualism, and the perceived sense of minority status vis-à-vis the linguistic and denominational surroundings of Buenos Aires are all factors not captured by census data on nationality. SOURCE: Segundo Censo de la República Argentina, Vol. 2, Población, clxii–clxiii. SOURCE: Tercer censo nacional, Vol. 1, antecedentes y comentarios, 205–206. There was a large statistical imbalance between German-speaking men and women, which was a common phenomenon for many groups of immigrants in Argentina in this period. In 1895, 66 percent of German and Austrian citizens residing in the country were men; in 1914, the disparity was almost the same, at 65 percent.68 Similarly, in 1895, 65 percent of Spanish citizens, 64 percent of Italian citizens, and 60 percent of French citizens in the republic were men.69 In 1914, 62.5 percent of all foreign nationals in Argentina were men.70 This gender difference was one structural factor that created the male-dominated institutions that claimed to form the city’s German, Spanish, Italian, French, and other communities. Focusing in particular on social welfare, education, and religion, the chapters of this book analyze the efforts of German-speaking immigrants to carve out a place for themselves in the landscape of an extremely culturally plural society. Chapter 1 analyzes how affluent German-speaking immigrants and Argentines made use of social welfare institutions to establish a community. Through their involvement in social welfare and in negotiation with other social actors such as the Argentine state, the Catholic Church, and wealthy Spanish-speaking philanthropists, thousands of immigrants and Argentine-born German speakers gave shape to the meaning of citizenship. They tried to create male breadwinners who supported their families, to foster the image of productive and healthy workers, and to ensure that German-speaking female laborers conformed to an ideal of respectability. These community-oriented social welfare programs also created a specific image of the city’s German community in the eyes of outsiders, and through their involvement, affluent German speakers gained access to social, gender, and class power. Chapters 2, 3, and 4 shift the focus to education. In the late nineteenth and early twentieth centuries, German, British, French, Jewish, Italian, and many other immigrants founded bilingual schools in the Argentine capital.76 Their projects emerged in the 1880s and 1890s at a moment of change in the country. Fueled by the international circulation of ideas about pedagogy, education in Argentina ceased to be something reserved for a minority of children and became almost universal. Politicians and education reformers believed that they could create a new kind of citizen, equipped with the civic, cultural, and economic knowledge to contribute to society.77 At the same time, immigrants of many backgrounds also became involved in education. Teachers, parents, and self-appointed community leaders navigated between their own cultural identities and the linguistic practices and citizenship of children. They created a network of bilingual schools alongside the expanding system of public elementary schools. Interacting with state reformers and the Catholic Church, German-speaking and other immigrant school promoters carved out a place for themselves in questions of education. Chapter 2 examines the role of family, children, and language in the emerging German-language educational project in Buenos Aires. The teachers and pupils at these schools sought to broaden the definition of citizenship espoused by Argentine nationalists in order to allow a space for cultural pluralism. These schools also modified what it meant to be German in the country as educators took an active interest in Argentine civics and the Spanish language. The teachers and leaders of these schools often spoke about future citizens, and their activities were a prime example of how historical subjects thought about and oriented their activities toward the future. Parents and educators wanted Argentina to be a place where Spanish and other languages were spoken at advanced levels and where young Argentine citizens would learn about their parents’ countries of origin in Europe. These ideas faced off against turn-of-the-century Argentine nationalists who sought to forge a more united, ethnically homogeneous, and Hispanic nation. Chapter 3 takes up the focus on state-community relations. Starting in the 1880s, the Argentine National Council of Education (Consejo Nacional de Educación) enacted a series of policies that regulated immigrant-run schools, a system that also allowed space for immigrant educators to foster bilingualism and a more plural vision of what they wanted Argentina to be in the decades to come. Chapter 4 maintains the focus on education but shifts to the transatlantic relationships that German-speaking Argentines developed with the Foreign Office and nationalist groups in Germany. The circulation of teachers, financial support from Germany, and a system of offering both Argentine and German diplomas reveal important influences on German-Spanish bilingual schools in Buenos Aires between the 1880s and 1920s. However, German-speaking educators navigated between those transatlantic influences and their own interests in community and belonging in Argentina. Chapter 5 maintains the transatlantic approach taken in chapter 4 and tracks the connections between Lutheran and Catholic groups in Buenos Aires and others in Imperial and Weimar Germany. People, ideas, and finances circulated across the Atlantic and through Buenos Aires to the Argentine interior. Nevertheless, it was religious categories rather than linguistic or national ones that defined these flows. The chapter shows that denominational identities shaped how many people of German heritage in Argentina understood the boundaries of community and their sense of belonging in Argentine society. As was the case with transatlantic educational networks, practicing Lutherans and Catholics accepted transatlantic support while also taking a strong interest in the place of their denominations in Argentina far into the future. Building on the previous chapters on education, chapter 6 further queries how immigrants and bilingual Argentines tried to reconcile cultural pluralism and Argentine belonging in the late nineteenth and early twentieth centuries. Looking at German-speaking Lutherans and Catholics, it shows how denominational identities played a central role in many people’s visions of ethnicity and community in Buenos Aires. German speakers in Buenos Aires, together with hundreds of thousands of other immigrants and their children, created a framework between 1880 and 1930 that defined the relationships among the state, the public sphere, religious institutions, ethnic organizations, and family that would then evolve throughout the twentieth century. The definitions of German ethnicity slowly changed in Buenos Aires, as did the nature of the linguistic and cultural pluralism in Argentine society. Ideas about the future drove German-speaking immigrants to build and support a range of institutions. In so doing, however, these immigrants and second-generation bilinguals created overlapping German communities. They navigated among denominational, linguistic, German, and Argentine identities. 2. Koselleck, Futures Past, 268. 7. Böhm, “Judíos alemanes,” 475. 9. Bertoni, Patriotas, cosmopolitas y nacionalistas, 191. 10. Moya, Cousins and Strangers, 350. 12. Bertoni, Patriotas, cosmopolitas y nacionalistas, 192. 13. Moya, Cousins and Strangers, 365. 14. Carli, Niñez, pedagogía y política, 39; Lionetti, La misión política. 15. Bertoni, Patriotas, cosmopolitas y nacionalistas. 16. Canning and Rose, “Gender, Citizenship and Subjectivity,” 427. 18. Baily, Immigrants in the Lands of Promise, 74. 19. Moya, Cousins and Strangers, 489. 21. Censo general, 1910, 17. 22. McGee Deutsch, Crossing Borders; Baily, Immigrants in the Lands of Promise. 24. Sollors, The Invention of Ethnicity; Conzen et al., “The Invention of Ethnicity”; Lesser, Negotiating National Identity; Lesser, Immigration, Ethnicity, and National Identity. 25. Brubaker and Cooper, “Beyond ‘Identity,’” 14. 27. Otero, Historia de los franceses, 20–21. 28. Lesser and Rein, “Challenging Particularity,” 251, 256. 29. Newton, German Buenos Aires; Saint Sauveur-Henn, Un siècle d’émigration allemande; Newton, The “Nazi Menace”; Groth, Das Argentinische Tageblatt; Kelz, “Competing Germanies”; Schnorbach, Für ein “anderes Deutschland”; Ismar, Der Pressekrieg. Manz, Constructing a German Diaspora; Choate, Emigrant Nation; Aliano, Mussolini’s National Project; Finchelstein, Transatlantic Fascism. 31. Glenn Penny, “Latin American Connections,” 364. 33. Chickering, We Men Who Feel Most German, 44. 34. Sargent, “Diasporic Citizens,” 23–24. 35. Manz, Constructing a German Diaspora, 11. 36. Conrad, Globalisation and the Nation, 279. 38. Naranch, “Inventing the Auslandsdeutsche,” 26. 39. Conrad, Globalisation and the Nation, 386. 40. Brubaker, Citizenship and Nationhood, 114. 41. Kloosterhuis, Friedliche Imperialisten; vom Bruch, Weltpolitik als Kulturmission; Rinke, “Der Letzte Freie Kontinent”; Mitchell, The Danger of Dreams; Conrad, Globalisation and the Nation. 42. Newton, German Buenos Aires; Newton, The “Nazi Menace”; Groth, Das Argentinische Tageblatt; Schnorbach, Für ein “anderes Deutschland”; Ismar, Der Pressekrieg; Saint Sauveur-Henn, Un siècle d’émigration allemande; Bindernagel, “Migration und Erinnerung”; Mitchell, The Danger of Dreams; Herwig, Germany’s Vision of Empire; Manz, Constructing a German Diaspora; Conrad, Globalisation and the Nation. 43. Rein, “Ethnicity and Diaspora,” 11. 44. Weitz, Weimar Germany, 145–47. 45. Brubaker, Citizenship and Nationhood, 13. 48. Baranowski, Nazi Empire; Gosewinkel, Einbürgern und Ausschließen. 49. Resumen estadístico del movimiento migratorio, 3; Moya, Cousins and Strangers, 56. In these same five decades, 2.6 million people left the country, but not all those who left were immigrants. 51. Segundo censo, Vol. II, xviii; Tercer censo, Vol. I, 65. 52. Moya, Cousins and Strangers, 149. 53. Tercer censo, Vol. I, 202. 54. Base de datos, Bernasconi; Resumen estadístico del movimiento migratorio. 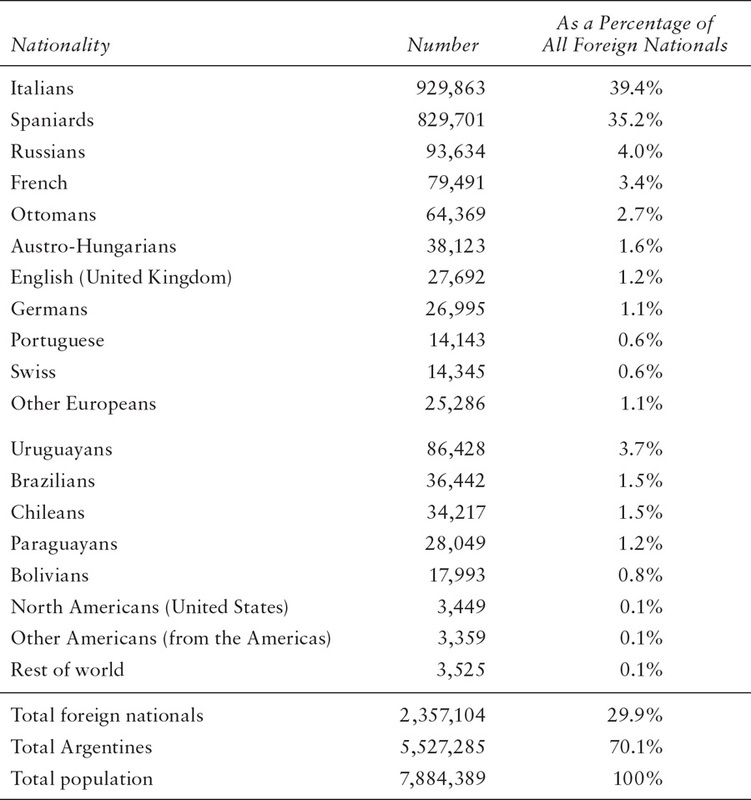 Between 1857 and 1914, 62,006 Germans, 136,079 Austro-Hungarians, and 33,057 Swiss entered Argentina, but only a portion of the Austro-Hungarians and Swiss were German speakers (Tercer censo nacional, Vol. 1, antecedentes y comentarios, 201). 55. Saint Sauveur-Henn, Un siècle d’émigration, 256–57. 56. Weyne, El último puerto, 33; Riffel, Die Rußlanddeutschen, 54. 57. Lesser, Negotiating National Identity; Lesser, A Discontented Diaspora; Lesser, Immigration, Ethnicity, and National Identity. 58. Brodsky, “Educating Argentine Jews,” 33–51; Lesser, Immigration, Ethnicity, and National Identity; Lesser, Negotiating National Identity; Lewis Nouwen, Oy, My Buenos Aires; McGee Deutsch, Crossing Borders. 59. Lesser and Rein, “Motherlands of Choice,” 156. 60. Segundo censo, Vol. II, clxiii. 61. Meding, “Procesos de integración retardados”; Bjerg, Historías de la inmigración. 62. Saint Sauveur-Henn, Un siècle d’émigration allemande, 345. 64. Jefferson, Peopling the Argentine Pampa, 66. 65. “Ueber die Zahl der Deutschredenden in Argentinien,” Argentinischer Volksfreund, 3 April 1912, 7. 66. Mirau, Argentinien von heute, 119. 67. “Deutschtum in Argentinien, 1920–1934,” 21 July 1921, R 78796, Politisches Archiv des Auswärtigen Amts, Berlin. 68. Segundo censo, Vol. II, clxiii; Tercer censo, Vol. I, 205, 206. 69. Segundo censo, Vol. II, clxiii. 70. Tercer censo, Vol. I, 206. 71. Base de datos, Bernasconi. 72. In 1890, 62.8 percent of people in that country were nominally Protestant, 35.8 percent Catholic, and 0.3 percent of other Christian denominations. Of the 49.4 million people in Imperial Germany, 567,884 (1.1 percent) were Jewish (Craig, Germany, 181). 73. Base de datos, Bernasconi. 74. Lesser and Rein, “Motherlands of Choice,” 149; Saint Sauveur-Henn, “Die deutsche Einwanderung,” 13; Groth, Das Argentinische Tageblatt; Saint Sauveur-Henn, Un siècle d’émigration allemande, 258. 75. Newton, German Buenos Aires; Saint Sauveur-Henn, Un siècle d’émigration allemande; Rohland de Lanbehn and Vedda, Anuario Argentino de Germanística IV. 77. Carli, Niñez, pedagogía y política.